If you’re still stuck playing lottery the traditional way, you are missing out on a lot. Sure, purchasing tickets at the store has its perks—it’s cheaper and you can actually hold the lottery ticket in your hand. However, online lotteries have made large strides in improving their service since their introduction in the industry years ago. Not convinced? Read on to see why playing lotteries online is much better! [h2 display=”No Need to Go to the Store to Buy Tickets” menu=”No Lining Up For Tickets”] The most obvious benefit of playing lotteries online is you don’t have to go to a store, line up, and buy a ticket. Not only does it save you time, you also get to save up some money that you would have otherwise spent on gas or fare—or even food. Most lottery sites that identify as lottery agents take care of ticket purchases for you. Once they receive a purchase order from a player, they send out their agents to purchase the tickets on your behalf. They will then scan the tickets and send you a copy, while keeping the original in a vault for safekeeping. 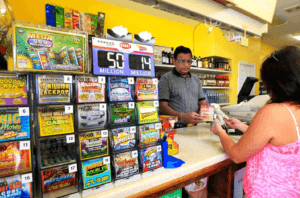 No need to head to the local store to get lottery tickets with online lottery sites! Meanwhile, lotto betting sites does things a bit differently. Unlike lottery agents, they don’t purchase any official lottery tickets, period. What they do is they simply allow players to bet on official lottery outcomes. So, whichever of the two you end up using, you don’t have to go out of your way just to play the lottery. You can simply take a few minutes of your day to purchase an entry and quickly go back to what you were doing. [h2 display=”You Can Participate in Lotteries from Around the World” menu=”Play International Lotteries”] Playing lottery the traditional way means that you can only play lotteries that are available in your area. Going online, however, opens the doors to a whole host of games. 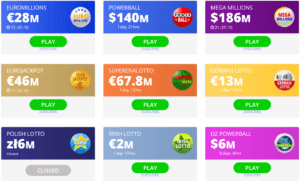 Most lottery sites—especially industry stalwarts the likes of theLotter and WinTrillions—offer games from around the world. Play in various lotteries from all over the globe! The usual lottery games featured on sites come from the US, UK, Spain, Germany, France, Brazil, Japan, and more. You can play in one, two or all of them at the same time, too. There’s no limit! [h2 display=”You Can Play Other Games” menu=”Play Other Game Types”] Most lottery sites don’t just offer standard, single play lottery games—they also offer other a variety of game types. If you’re fond of group play games, most sites also offer syndicates. Sometimes, sites also offer syndicate bundles, which gives you more lines to play with. You get access to tons of other games as well–which means more chances of winning! Other sites also offer some of the biggest millionaire raffles, while others also offer interactive games. The latter consist of virtual scratch cards and, in some cases, instant win games (usually styled liked video games). These usually offer smaller prizes, but for those looking for a more casual, interactive experience, these fit the bill. [h2 display=”There’s Various Bonuses on Tap” menu=”Bonuses Abound”] While most lottery sites tack on extra fees to tickets, they make up for it by offering players a variety of ways that can help them save. Multi-draw discounts are the most common. As the name implies, players get discounts the more draws they choose to participate in. These could be anywhere from 5%-25% off. 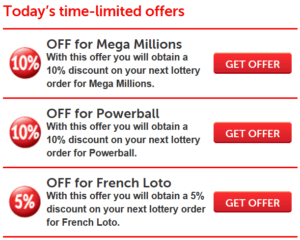 Check out lottery sites’ bonuses to get the most out of the experience! Many lottery sites also have VIP programs, which is open to all players. Usually, all you have to do to be eligible for VIP membership is to make a purchase. Once you’re a VIP, you can get discounts by qualifying for the different tiers. To qualify for each tier, you must have the required number of points, which means you have to keep playing. Usually, $1 will net you 1 VIP point. Beyond that, other lottery sites also offer free tickets just for signing up for an account, or by successfully referring people to them. Others, meanwhile, offer generous cash back promos on first purchases. Some sites offer unique promos you won’t find anywhere else. One lottery site, for instance, provides winners with free trips to Australia—hotel accommodations included. [h2 display=”You Can Play Anywhere, Anytime” menu=”You Can Play Anywhere”] Since everything is online, you don’t have to be tied down to a computer at home or at work to play lottery games. 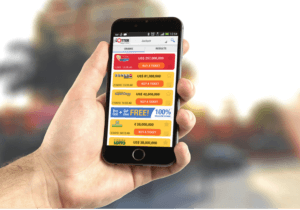 A lot of lottery sites offer mobile apps—or mobile-optimized websites—that allow you to check results, purchase tickets and more straight from your mobile device. So, if you lead a very hectic, on-the-go lifestyle, you can simply whip out your phone or tablet and check the latest winning numbers or enter the upcoming US Powerball draw. [h2 display=”You Can Pay Using Various Methods” menu=”Payment is Convenient”] When it comes to lottery sites—especially the best ones—flexibility is the name of the game when it comes to payment methods. Most lottery sites allow you to pay via popular credit cards like Visa or MasterCard, but they also accept other modes of payment if you don’t use those credit cards. The usual payment methods accepted include bank transfers, NETeller, Skrill, giropay, Sofort, PayPal, Bitcoin and a other online e-wallets. [h2 display=”In Some Cases, Prizes are Claimed for You” menu=”Prize Claiming is Easy”] For the most part, lottery sites make prize claiming a breeze; but, when it comes to larger wins, most sites require you to claim the winnings on your own, in person. However, there are some lottery sites that can claim all winnings on your behalf so you won’t have to travel far. These sites either deposit the prize directly to your account, send you a check, or have you collect it at one of their offices nearest you. [h2 display=”Security is Important” menu=”Security is Important”] A lot of lottery sites—those on the up-and-up, at least—employ tight security measures so your transaction details won’t fall into the wrong hands. Legitimate lottery sites utilize quality SSL encryption and spam filters as their first line of defense to guard against prying eyes and spammers, for instance. They are also licensed and regulated by either a gambling commission, a government, or both—so you know they are operating under strict guidelines. 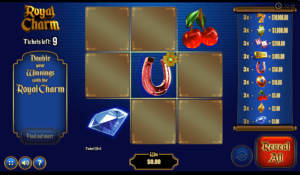 [h2 display=”The Bottom Line” menu=”The Bottom Line”] As you can see, playing lottery online provides way more benefits compared to going at it the traditional way. Sure, it has its drawbacks, too—like slightly more expensive tickets, for example—but the positives definitely outweigh the negatives. It’s easy, convenient, and it provides more chances of winning. What more can a lottery fanatic ask for?